Gingivitis, an early stage of gum disease, is one of the most common problems people experience when it comes to maintaining a healthy, attractive set of teeth. It is the mildest stage of gum disease and normal symptoms include red, swollen gums, bleeding when you brush and persistent bad breath. Although it is easily fixed by following a reasonable maintenance schedule, if left unchecked it can eventually lead to periodontitis, a much more serious affliction. Obviously, the first step toward any healthy set of teeth is a regular checkup with your dentist, but there are also other ways you can improve your smile and avoid gingivitis. 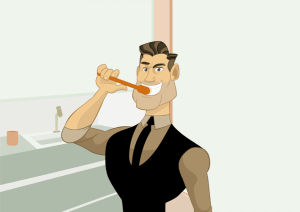 Use your toothbrush at least two times every day, or more, if you can. Brushing after every meal is a good habit to get into. Use a toothbrush with soft bristles and switch it out every three months. Using an antimicrobial toothpaste will greatly help prevent gingivitis. Always make sure you brush before going to bed, as overnight is when bacteria have the most uninterrupted time to wreak havoc in your mouth. Some may find this a hard schedule to keep, but if you can make flossing part of your daily routine it will no longer be something you have to remember. Flossing is crucial for removing the plaque under and around the gums that is most likely to lead to gum disease. Vitamin D has anti-inflammatory properties, making it particularly useful in preventing gingivitis. Calcium will strengthen your teeth and jaw, reducing the risk of gum disease, and Vitamin C can help with bleeding gums. As important as it is to keep up a regular schedule of brushing and flossing, there is no substitute for the deep clean you get from a professional teeth cleaning. Experienced hygienists will get all the areas you may have missed or neglected. Be sure to make time for your teeth by setting up an expert tooth cleaning with Pennsylvania dental specialists Jenkintown Dental, where they will not only keep your teeth looking great but help stop gingivitis before it starts.